I have always been a fan of breakfast cereals. There are some that I usually enjoy in a bowl of milk as a way to start the day and other, sweeter cereals that I often snack on later in the day. 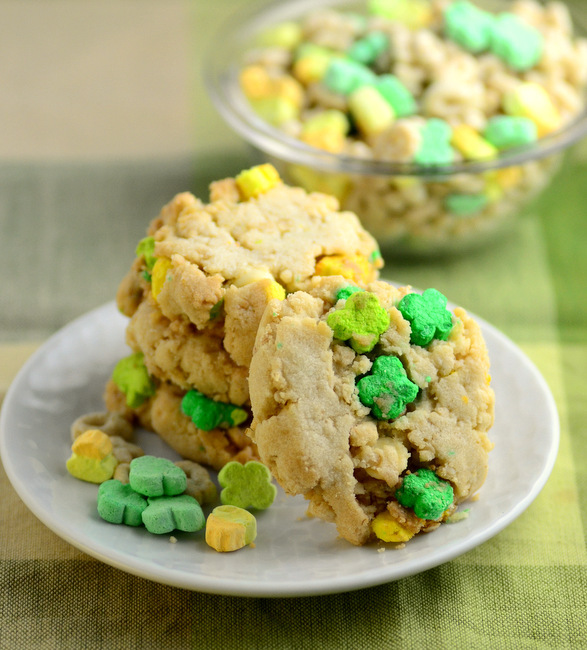 But I have been known to think outside the bowl and turn cereal into all kinds of other treats, from cereal bars to ice cream to these Crisp Lucky Charms Cereal Cookies. 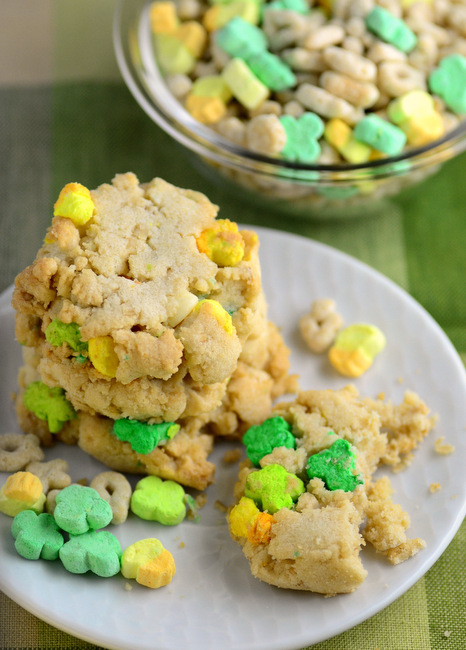 These crisp cookies are made with Lucky Charms and use both the cereal and the marshmallows! They’re delicious even if you’re not usually a cereal-lover and a must-try if you are. These cookies are crisp and have that buttery, melt-in-your-mouth texture that will remind you of shortbread, but they’re not a classic shortbread cookie. Shortbread cookies are typically made with all butter, while these are made with both vegetable oil and butter. This combination gives the cookies a wonderfully crisp texture without the finished cookies getting too hard. The cereal itself needs to be sorted by hand before you start baking, separating the cereal bits from the marshmallows. I used a limited edition box of Lucky Charms that only had clovers and pots of gold, rather than the full rainbow of available marshmallows. You’ll need about 1 cup of cereal bits, which should be crushed by pounding them with a rolling pin or whizzing them in the food processor. You’ll also need about 1 cup of marshmallows. Everything gets mixed into the cookie dough, which comes together easily, but tends to be drier than some other cookie doughs thanks to all the mix-ins (especially the marshmallows, which sometimes need a little help to stick in the dough as you shape it into individual cookies). Shape the dough into 1-inch balls (or slightly larger) with your hands, then arrange on a parchment-lined baking sheet. Use the bottom of a glass or the back of a spoon – dipping your instrument of choice in a bit of water to prevent sticking – to flatten the dough into circles, then bake until golden around the edges. The cookies will crisp completely as they cool. Since they are dehydrated to begin with, the marshmallows really hold their shape in the cookies, leaving you with great color and pockets of extra sweetness as you nibble your way through each one. In a large bowl, cream together butter and sugars until light. Beat in egg and vanilla extract, followed by vegetable oil, mixing until smooth. Stir in the flour mixture until only a few streaks of flour remain visible, then add in the finely crushed cereal and oatmeal and mix until cookie dough is uniform. Stir in marshmallows. Shape the dough into 1-inch balls using your hands, as the dough may be slightly crumbly (due to the marshmallows). Arrange on prepared cookie sheet, then flatten each with the back of a spoon or the bottom of a glass (dipped in water to prevent sticking). Bake for 10-12 minutes, until cookies are light golden around the edges. Let cool on the baking sheet for about 5 minutes, then transfer to a wire rack to cool completely. Store in an airtight container. Came out wonderful!!! It was so quick and delish!